The dignity and really overwhelming beauty and solemnity of a Coronation ceremony cannot be conveyed in words, and only those who have had the privilege of being present can fully realize what it is like. One little incident at Edward VII’s Coronation I think might be mentioned. My seat was just behind that of my dear Aunt Beatrice, and under the Royal Box was displayed all the priceless Chruch plate belonging to the Abbey. Aunt Beatrice was very proud of her bound and specially-embroidered copy of the Coronation Service, presented to her by the Ladies’ Needlework Guild. Although I whispered a warning that, if she continued to fidget, it might go overboard, there soon came an agonized murmur: ‘Louie, it’s going – oh dear, it’s gone!’ And gone it had with a terrible clatter among all the Church plate. And here is a ‘flashback’ of lovely Queen Alexandra during the Coronation ceremony. She was perturbed because a drop of the Holy Oil with which she had been anointed had trickled down on to her dear little nose, fear of irreverence preventing her, as she told me, from using her handkerchief. She milled around in the junior circles of the Royal Family – elsewhere I read that at some point she & her sister might have been considered as possible brides for a then-Prince of Wales – and that their mother certainly wanted them in the frame. But that was not to be, and that particular Prince became engaged to May of Teck, then died, leaving his brother (the future George V) to marry May and climb to the throne. All a bit Henry VIII/ Katherine of Aragon, but not so disastrous. Her sister, Princess Helena Victoria, never did marry, and our narrator wasn’t much better off. She married one Prince Aribert of Anhalt, but it was not a successful relationship and the marriage was dissolved. She was not too happy about this, according to her book. No-one really knows what happened, though there is a reference elsewhere to Queen Victoria helping the Princess in a marital ‘awkwardness’: impressive, as the annulment happened just a month before the old Queen died. The Princess never married again, feeling herself still bound by her marriage vows. She settled in for a life of charitable works and Royal socializing in England, and quite surprised her cousin King George V by telling him she travelled by bus. One of her projects was the creation of the great doll’s house for Queen Mary. She does have great descriptions of the formal occasions of State, the life of a minor Royal, the presentation of debutantes and how that has changed – and, always, great clothes descriptions. 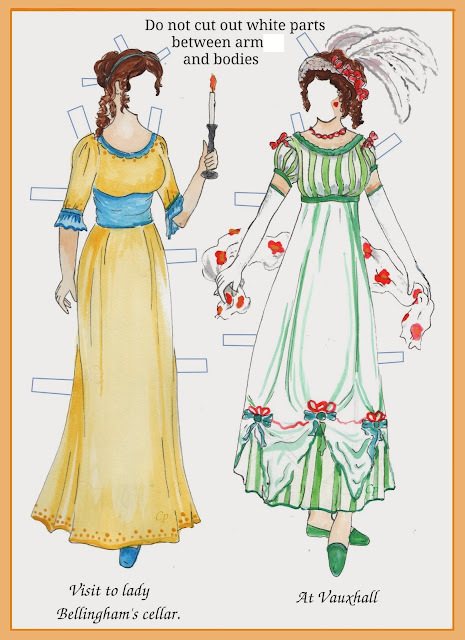 She has an eye for the telling detail – how the princesses’ trains changed from 3 yards to 1.5, for example. There is a nice story of a German court official’s wife who went to the opera ‘half-dressed’ – she wore a white satin bodice on top, then boots, galoshes and a tweed skirt below. No-one would see her in her box, and they could save the cost of a carriage by walking to and from the theatre. Recently the blog looked at the private chapel at Madresfield, as featured in Brideshead Revisited: the Princess visited the house often, and was there when the Second World broke out, and describes going to pray in the chapel on that day. The picture shows the Princess dressed for the Coronation of Queen Elizabeth II in 1953, when she was 80. She wrote her memoirs in the next few years, and died in the year they were published. Oh, Moira, this sounds like a really interesting look at an era! Whether or not she had a ghost writer, I'll bet her perspective on the people of the times is fascinating. And as long as they're not too self-serving, I do like the sort of memoir where you get 'behind the scenes' looks at a group of people. Yes Margot - some of us may wonder about the lives those people led, but she couldn't live that long, in those circles, and through those changes without having something interesting to say. This does sound very interesting. In the photo, she does not look very happy. I think she may well be of a generation that thinks you should look serious in a serious photograph - you never see her grandmother, Queen Victoria, smiling in photos! I think she had a very unhappy marriage, but then managed to make the most of the rest of her life. Moira, the author had a ringside view of the Royal family whose history I like to read, especially on account of their familial links with other royal families across Europe including Russia. And I do like the way she addresses the reader, lending a personal touch to the narrative. Yes, it was a most enjoyable read. I think she was fairly discreet, she wasn't dishing the dirt, but it gave a nice domestic view of the lives of the outer edges of the Royal family. Not a Royalist myself, so occasions such as funerals, weddings etc (not old enough for a Coronation) are opportunities to tidy the shed, or bath the dog, or clean the car. Reading about them might be slightly less torturous, but I doubt it.